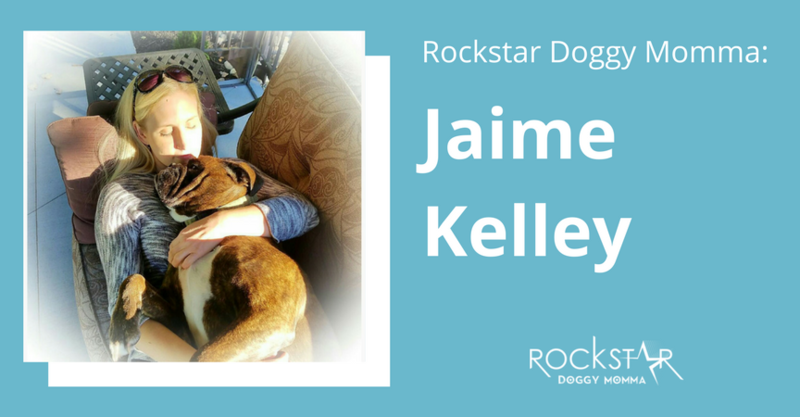 This month’s Rockstar Doggy Momma is Jaime Kelley! Jaime is the mother of Mugzy, an Olde English Bulldog. 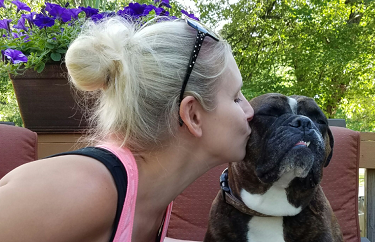 Her dog Mugzy not only inspired her to go vegan but was the inspiration behind her organic dog treat company as well. Here’s her story. Tell us the story of how you became a doggy momma! Did something in your life happen that influenced you to get your doggy? My Mugzy has had a profound impact on my life. To start, I became a vegan because of him. He is my first dog I’ve ever had and my love for him is immeasurable. One day I asked myself a difficult question: how can I love this animal SO much but be ok with eating others? From there, my journey began and I’m on the way to being 100% vegan now. Mugzy was also the inspiration for starting an organic dog treat business called Mugzy’s Barkery. I hand craft all natural and organic dog treats out of the highest quality human grade ingredients. This began by me just making his treats because I didn’t trust the questionable or dangerous products in stores. I took matters into my own hands and decided to make his treats and food. My dog trainer was over for a session one day and saw them. She thought they were great and encouraged me to sell them. From there Mugzy’s Barkery was born. I have now expanded locally into retail stores, several farmers markets and this year I will have a storefront. Mugzy has been the best thing that’s ever happened to me and because of him not only did I discover my passion but I get to share it with other dogs and give their people the peace of mind that comes with giving your dog the very best. What is the #1 thing you love about being a doggy momma? The best thing about being a doggy momma is the endless joy, laughter, and love Mugzy brings me. Not a day goes by that he doesn’t make me laugh. What do you do together to stay happy and healthy? Mugzy and I live a pretty laid back lifestyle. We enjoy lounging poolside together to de-stress, snacking on organic treats and we like to go for walks in the town park to splash in the stream. What is the biggest gift you have experienced being a doggy momma? The biggest gift from being a doggy momma is that Mugzy has inspired me to follow my vision and passion. 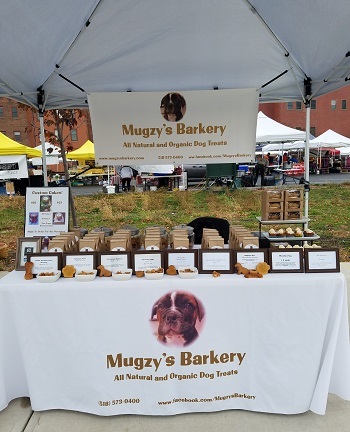 Starting Mugzy’s Barkery Organic Dog Treats has been an amazing experience and I am truly blessed to be able to share my safe and healthy treats with others. So much of my heart goes into each and every treat and I enjoy spreading the love!